After 12 years of development, a miniature FMI scanner for newborns has been installed at a maternity hospital here in the UK—and it’s kind of adorable. The new scanner, one of only two in the world, is part of a two-year project to test the feasibility and effectiveness of these diminutive devices, which would be used to test for brain abnormalities and other birth complications on newborns, especially preemies. Its compact size ensures minimal movement of newborns (increasing the accuracy of the scans), while dramatically reducing risk of physical injuries. It provides more clinical information than a handheld ultrasound scanner, allowing for more accurate diagnoses. 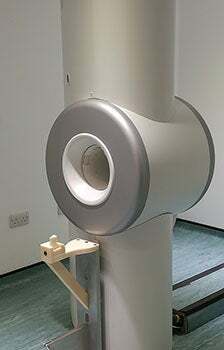 The mini-scanner was recently installed at the Royal Hallamshire Hospital in the Jessop Wing, and is part of a collaborative project between the University of Sheffield, GE Healthcare (which manufactured the device), Sheffield Teaching Hospital NHS Foundation Trust, and the Wellcome Trust. Because the miniature scanner is smaller than a conventional MRI device, it can be installed within or next to a neonatal unit. Newborns can be scanned without having to be moved to another part of the hospital. Scans can therefore be performed more quickly, and the risks and complications associated with moving a vulnerable baby are dramatically diminished. Griffiths says the new MRI shows the entire brain and the surrounding anatomy, making images easier to explain to parents. A big advantage from a diagnostic perspective is that the device can show a wider range of brain abnormalities, particularly those resulting from a lack of oxygen or blood supply. The revolutionary scanner has already been put to good use, with about 40 babies imaged in the device so far. 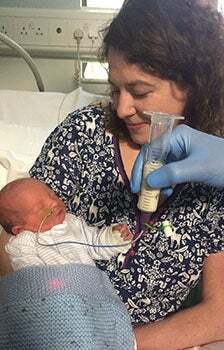 Toby Thoms, who was born six weeks premature and delivered via cesarean, recently spent a week in neonatal care with his mother, Susie.